No matter how many years I work out and how many workout moves I’ve done, I still like to take direction when I exercise, whether it’s with a DVD or an old-fashioned paper list. If it’s just me and an empty room, I swear the only exercises I can remember are push-ups, lunges and downward dog. If you’re like me (surely I’m not the only one! ), I’ve got the perfect way to remember yoga moves when you’re away from your DVD collection or personal trainer! 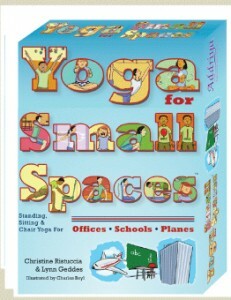 Similar to the ABC Yoga Cards for Kids that we reviewed on Fit Bottomed Mamas early this year, Yoga for Small Spaces is a deck of 52 cards, each featuring a different yoga posture. Even better? The poses were specifically chosen because they can be done with minimal space and equipment. Because not a lot of room is needed, these moves are perfect for classrooms, offices, cars and airplanes. So whether you can take a mid-day yoga break in your office, or you do a lot of traveling and need some moves to try on the plane, this deck is the perfect, compact companion to keep you on the fitness track.